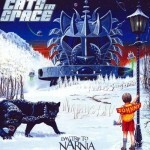 Share the post "Album review: CATS IN SPACE – Daytrip to Narnia"
Album number three already from these groove filled Cats In Space who since their last album ‘Scarecrow‘ have been touring with the likes of Status Quo and Deep Purple, plus their own headlining tour. In fact the band’s touring helps hone their sound and make it a proper band when recording, unlike many of these project bands that lack the natural chemistry you get from said touring. Cats In Space like a little bit of classic innuendo as ‘She Talks Too Much’ proves. A quick, almost throwaway song that Queen did so well back in their 70s pomp. Speaking of pomp and all things glam, ‘Silver & Gold’ is a glamtastic stomp back into the days when Sweet and Slade ruled the airwaves and charts. As an added bonus the Sweet’s Andy Scott guests on backing vocals. Scott also appears on ‘Hologram Man’, a topical swipe at the current trend of dead rock stars coming back to front their bands. Some choice lyrics in this one including ‘Let’s welcome back the legend, But you can’t shake his hand’ and ‘He won’t get tired of playing’. Greg Hart and Mick Wilson (ex-10CC) are a talented writing duo, successfully adding in their own musical influences, yet also creating a unique Cats In Space sound and style. Special mention about the artwork by Andy Kitson, a real treat for those who love a good album sleeve and inlay. You can see Narnia references like the lamppost and wardrobe (the Snow Queen looks like Blackie Lawless at first glance!) and the bedroom artwork is something else, astounding. One minute it could be ELO on string filled ‘Twilight’ (not the ELO song of that name though), then there is a little disco on the excellent ‘Thunder In The Night’ – think Kiss jamming with Chic. Bit of the Bay City Rollers on ‘One Small Step’ – that would have been a teen anthem back in the day. This entry was posted in ALBUM REVIEWS, ALBUM REVIEWS (Mobile), All Posts and tagged 10CC, 70s music, album, Andy Scott, Cats In Space, disco, ELO, Greg Hart, melodic, pomp rock, pop, power pop, Queen, review, rock, Sweet. Bookmark the permalink.